Curved stairlifts have tracks that are specifically designed to suit your staircase. Because of this curved stair lifts are more expensive that the straight option. So if possible try and get a straight one installed if the user can negotiate a few stairs at the turn. Failing that you can go for the reconditioned stairlifts Dublin option. Getting a reconditioned stairlift is the most cost effective way of installing a stairlift in your home. We specialise in sourcing and installing refurbished stair lifts so the customers doesn’t have to fork out many thousands on a new stairlift. Call us for a free quote. 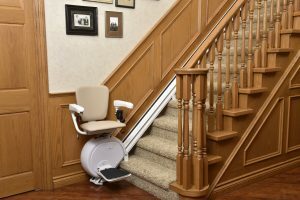 There are many reasons why our customers decide to opt for a stair lifts purchase. Many find the stairs too difficult to safely negotiate multiple times every day. Others are recovering from an operation or injury and need one for a few months. Some have relatives visiting their home who need one installed. Call us today for a free quote on any of our stairlifts Dublin location. If you are interested in scheduling a free in home stairlift audit to determine which type will fit your staircase and full quote, call us today.